At the TIPS community building event in Preston in December 2017, we lead a workshop exploring the temporalities of consent by mapping out the relationships between different services and products a user may consent to over time. We investigated the potential relationships and connections between different services and how they might be influenced over time. This design workshop considered the life cycle and temporality of consent beyond the on-the-spot instance of a user agreement. This aimed to further understanding of how internal and external factors may affect user consent over time and throughout different aspects of user’s lives. 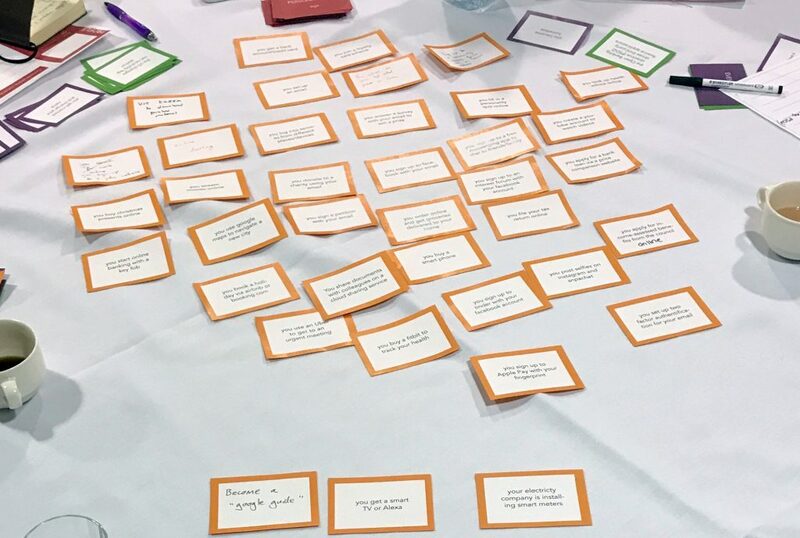 Questions around how consent may be influenced by a user’s life circumstances as well as technological developments and legal requirements were creatively explored via a set of design cards and activities. This workshop aimed to consider how more temporal or situation-specific forms of agreements may allow for more dynamically designed consent models. Moreover, the design activities aimed to expose and debate the relationships between different services, data and how they may develop over time. Changes in life circumstances may shift the way we view consent and what data we share. However, existing models of consent do not take this into account and services often do not allow a user to delete their account or the data that has been collected about them. So, what challenges for consent arise from changing circumstances in life and what are the relationships within such complex networks of shared data? Trustball – Who do you Trust to Consent? Retrieval-Induced Forgetting in the Real World – Work published in the Journal of Experimental Psychology: General.